Life is short.....get the crab legs and the cupcakes! While I am no food critic, I felt that today's testimonial had to revolve around my pre-birthday dinner, at The Iris Restaurant in Amherst NY. For those of you from the area, this (sadly) not (yet) well known restaurant is located in the Maple Ridge Plaza, near the AMC theater. They feature a very eclectic menu, which we plan on returning to try more of in the future. 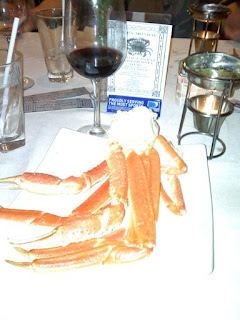 However, tonight's menu featured one of our favorites - all you can eat crab legs. They were hot, buttery sweet and cooked to perfection. Paired with a nice Malbec and a background of live music, we enjoyed ourselves immensely. 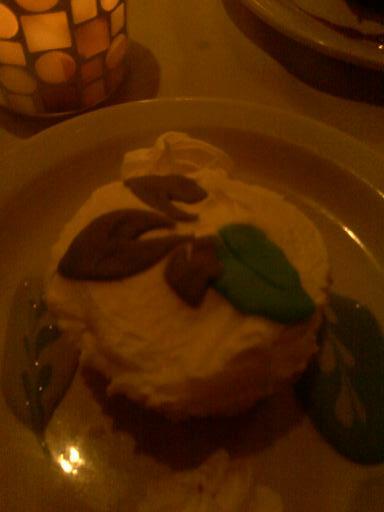 We finished off our meal with a duo of cupcakes. 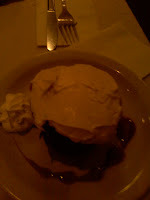 Hubby had the Irish Car Bomb - a chocolate cupcake, made with Guinness and an Irish Whiskey ganache. Both of them were a YUMMY way to end the meal. From the service to the chefs, the entire experience couldn't have been more pleasant. Sadly, we were one of the few tables there to enjoy the evening. It is a newer restaurant and just hasn't gotten the exposure that it deserves. After our dinner we moved into their adjoining bar, The Library for an after dinner drink. A cozy little bar, set up to resemble, surprise! - a library. They also feature small, intimate, musical performances and an impressive 20 beers on tap. The restaurant itself is situated in between The Library and The Forum, a performance venue, which features bands and musicians from all musical genres. Even the Iris itself gets into the musical act each Tuesday night, for their featured Jazz night. Word must be getting out, as we attended this 2 weeks ago, and it was standing room only by the end. We were told tonight, that AM Buffalo taped a segment recently, that will air this Wednesday morning. I'm keeping my fingers crossed that it will do them justice. Oh, and when it's your birthday, you order dinner and dessert....no questions asked.....Life is too short! PS. I was able to find this feature on The Library, from an old Gusto article. Looks like we weren't the only ones impressed. PPS. I could have written a "You can't make this stuff up," about the nasty table of four dining near us (I mean seriously, how demanding can you be?) And how could you possibly have gotten the only cold crab legs, when the rest of us are burning our hands off over here??" But that would have taken up my entire article. I guess I should have read your testimonial before posting on your wall for your birthday. Oh well.....glad to see that you did do something fun for your birthday anyway. Crab legs are one of my faves....and the cupcakes sound divine! This place sounds like heaven....! What a great way to kick off your birthday! Happy Birthday! I was initially concerned that you managed to mingle crab legs and cupcakes (two things I ADORE) but now I'm intrigued and excited to try a new place for dinner! @ Jackie - Crab legs are at the top of my list of faves....just pizza tonight...siggh :) Messaged you back. @ Barbara - Yes it was :) Thank you!